Important political leader. Wartime leader of the Peace Democrats (Copperheads), strong supporter of states' rights. One of Lincoln's strongest critics. " Vallandigham was born in New Lisbon, Ohio on July 29th, 1820. Prior to the outbreak of the Civil War, he was a lawyer, editor of the Dayton Empire, Ohio state legislator, and U.S. Congressman from Ohio. He was a member of the Democrat party, and the wartime leader of the Copperheads, a faction strongly opposed to the war. 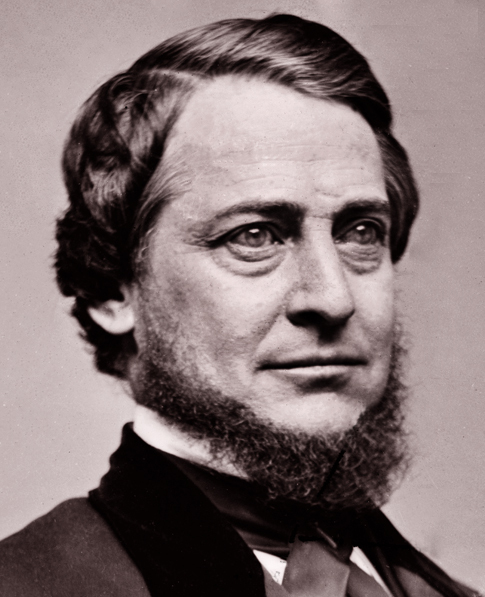 Vallandigham was not a secessionist, but had great differences with Abraham Lincoln. He strongly believed that the sole purpose of the war should be the preservation of the Union, not the abolition of slavery. He took every advantage to lash out at Lincoln and the Republicans on their handling of the war. His aggressive wartime criticism of Lincoln caused him great peril. In May of 1863, Major General Ambrose Burnside sent a large party of troops to place Vallandigham under arrest for sedition. Specifically, he was charged with violating General Order No. 38, which threatened punishment to those declaring sympathy for the enemy. He was tried by a military commission, convicted, and sentenced to a prison term. Lincoln, in his political wisdom, had the punishment commuted to banishment to the area behind Confederate lines. Vallandigham left the United States. He initially went to Bermuda, then to Canada. While in Canada, his supporters back in Ohio nominated him for governor. He ran unsuccessfully on the Democratic ticket. He returned to the United States, was not rearrested, and contributed to the adoption of a peace plank in the 1864 Democratic Party platform. Postwar, Vallandigham returned to his native Ohio, where he resumed his criticism of the Radical Republicans. He ran unsuccessfully for Congress. Vallandigham died in Lebanon, Ohio on June 17, 1871, the victim of a firearm. He accidentally shot himself with an item of evidence while preparing to argue a murder case.